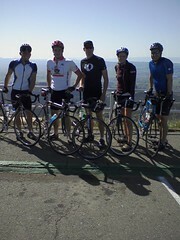 Today, some friends (one from high school, two from college, and one from high school and college) and I rode up Mt. Diablo in the east bay. It’s about a 3500 ft. climb up to the summit and almost nothing but descent on the way back. Wicked! On a sadder note, the Wine Country Century is full. I’ve ridden the last couple of years and blogged about it a couple weeks ago, but registration filled up early. Too bad. However, the Grizzly Peak century located in the same neighborhood as Mt. Diablo still has spots open. The registration spots available are around 900 compared to 2,500 for the wine country century, so I imagine it’ll fill up soon. Plus, I’ve heard it’s a pretty popular ride. Also, I wanted to give everyone a little glimpse into my day. 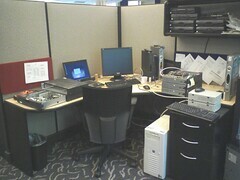 Here’s a picture of my desk with a pile of vintage hardware. Bitchin!